When the Nantucket ship Manchester (see footnote), with 21 people aboard, wrecked near Cape Horn on 28 August 1854, it became one more entry in the long list of ships lost on that dangerous passage between the Atlantic and Pacific oceans. But, why write a book about this sad event? First and foremost, there were survivors — two teenage boys were rescued 9 months later and returned safely to the United States. There was melodrama too: the captain's son lost both parents — his mother drowned as she abandoned ship, his father murdered by natives before his own eyes. 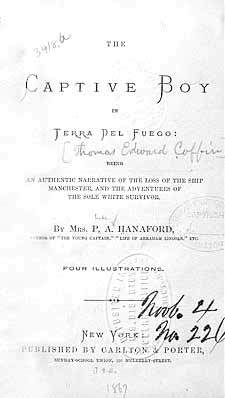 Plus, the author had taught the "captive boy" as a child. Last, but not least, she was an ordained minister, and a writer with several publications to her name. Events in Tierra del Fuego are told as a child's adventure story, with strong moral overtones. The action occurs in a far-away, awesome place, that the reader has never visited. The perils faced (shipwreck, fearsome natives, the death of loved ones) are surrogates for the stresses of life that we all must face. The book's illustrations are flawed as depictions of local dress and customs, but they were intended to stimulate the young reader's imagination. These extracts, taken from contemporary documents, graphically convey the hardship experienced by the survivors, and the gratitude of the community "back home". In their gift to the commander of the Chilean Navy ship Meteoro, which found the survivors at Port Gallant, on the Strait of Magellan, we see a sincere expression of solidarity with all who make their living and risk their lives on the sea. There are more cases of shipwreck on this site: see The Perils of Cape Horn. Note: Apparently, this was not the first voyage to the West Coast for the Manchester, nor for her Captain, Alexander Hall Coffin [A. H. Coffin]. The following references suggest they were previously engaged in supplying the California Gold Rush:-- see "Nantucket to California".